Elizabeth (Hannum) Broomall, daughter of James & Elizabeth (Kearney) Hannum, and descendant of John & Margery Hannum who settled in Chester County c1686. 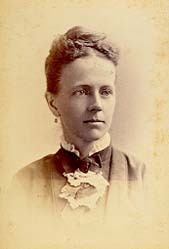 She married Taylor F. Broomall, whose family were also early settlers in the area. Elizabeth Broomall died on November 7, 1928.